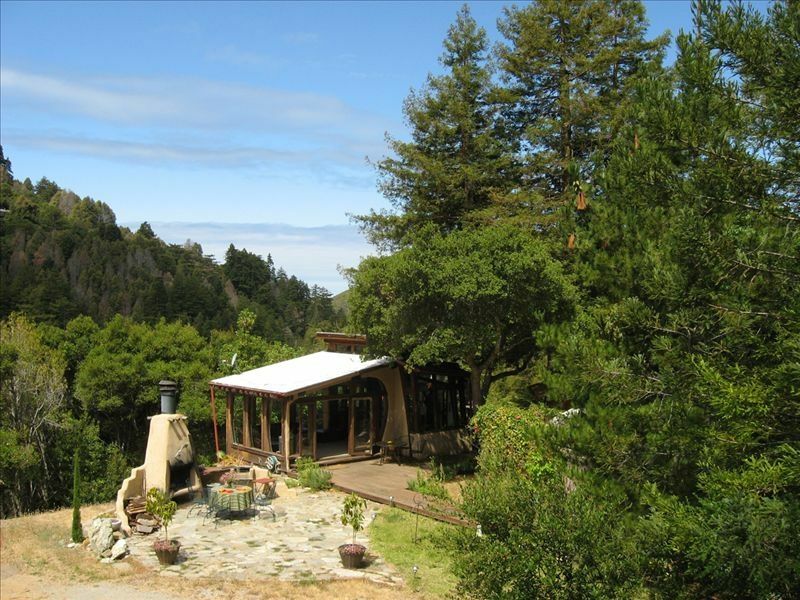 Big Sur Dream Home Completely private with an outdoor hot tub and fireplace. Drive up to your own privately paved and gated driveway to a home with a full 365 degree view of redwood and oak ridges. Full sun all day long. Perfect for one or two people. Arrive, relax and take a dip in the hot tub viewing the beautiful mountain ridge as birds sing and red tailed hawks circle above. Listen to the river flow as you sun bathe all day long without a soul to bother you. The deep ultimate luxury about my property is solitude and the stars at night. Queen size antique bed in adjoining yurt or queen bed in loft of home. * Satellite, WIFI, DVD, CD Player, Telephone. * Queen Size bed In Home Loft, and In My Spacious Yurt. * Activities: 10 min. drive to Garapata Beach. * Hiking books, maps, and activity guides provided. Make the most of your stay by booking in advance; Guided Hikes, Spa Services, and Catered Meals. Call Mary at the phone numbers listed below. This is a step above and beyond glamping. All glass tiny house in the Redwoods. Amazing sheets, comforter and pillows in the yurt. Hot tub and the stars! Just amazing. I'm happy you enjoyed your stay. Yes, the redwoods around the property are beautiful but the open space of full sun is such an enjoyment as well, with complete privacy. I do my best in keeping everything up to date with linens, covers, pillows, and other necessities in my home. Peaceful, unique - Amazing Stay! We had a wonderful time at Mary's property. It is nestled in the trees with complete privacy. The hot tub was great, same with the outdoor shower. We cooked all of our dinners there perched at the wood countertop. There was a great book in there we referenced for nice day hikes in the area. We would highly recommend!! I am so happy that you enjoyed your stay. I too enjoy the peace, quiet and the complete privacy when I'm there. I hope to meet you on another trip to Big Sur. This really is a Dream Home! Brilliant 2 night stay - my partner and I really switched off in this gorgeous setting. You can see that this unique house has been built and lived in with love and it was a really special addition to our California visit. Would highly recommend. Thanks to Mary and to Viola for showing us in and around. We have stayed at Mary's beautiful property several times now, and I can't recommend it enough! The location is so serene and private, and being nestled in the woods definitely has some magical healing to it. We will definitely continue coming back! We had such a wonderful stay!!! We loved the jacuzzi, the comfortable bed, the fireplace, the trees surrounding us, the sound of the creek and the amazing star gazing at night. It was also very secluded and was a great place for my fiancé and I to connect. There was only one small issue, the woman who showed us the property seemed to be rushed and not welcoming. She was not the host but might have been a neighbor helping out. It just made us uncomfortable initially but soon after she left we were able to enjoy our stay. I had a call with the host Mary and she seemed very sweet and nice so it's probably not an issue normally. Thank you so much for the wonderful review. I love, (when I am able to spend an evening on my property) just to have that privacy there and gaze at the stars in the evening! I deeply apologize if you felt my neighbor seemed rushed and unwelcoming, which I don't understand. She really is a great person so something must have been going on because she's generally calm and welcoming. I've never had an issue with her checking in any of my guests. I really appreciate you letting me know. I hope you both will return in the near future. Warmest regards and Happy Holidays to you both! Had a wonderful, relaxing time kicking back looking at the stars at night from the hot tub! Housekeeping Services $90 for the entire stay Check in time 2:30. No later then 5:00 p.m. or please call me regarding check in time.